Your help is needed to find a cure for Rett Syndrome; a rare condition that affects 1 in 10,000 girls. There is hope for a cure for Rett Syndrome that affects our grand daughter Kenzie and thousands of girls. Donate any amount to research and I will send you a complimentary copy of my book Be Bodacious: Put Life in Your Leadership. The research is promising; your donation large of small will help find a cure. 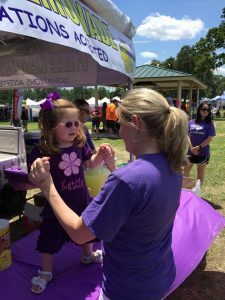 Kenzie’s Lemonade Stand for a Cure for Rett has raised thousand’s of dollars for research and 100% of your donation will go to Rett Syndrome research. So help the thousands of little girls affected by Rett and get my book as a gift to you. Be Bodacious:Put Life in Your Leadership is a different type of leadership guide, for a different type of leader. Illustrated by humorous and motivational stories, This book teaches three characteristics of a “bodacious leader:” an extraordinary commitment to a dream, unrestrained passion to pursue a dream and bold action to realize a dream. Presented in an engaging story format, Be Bodacious follows a young man who discovers the secrets of effective leadership through a mentor named “Cowboy,” a character who embodies the many leaders that have influenced my career and personal life. Though their conversations, Cowboy’s secrets to “bodacious leadership” are revealed, teaching readers how to become a better role model at home, in the community and at the office. Learn to live more, give more and help find a cure for Rett Syndrome. Please provide your shipping information and we will send you a copy of Be Bodacious and direct you to Kenzie's Lemonade Stand where you can find out more about Rett and donate to cure Rett.